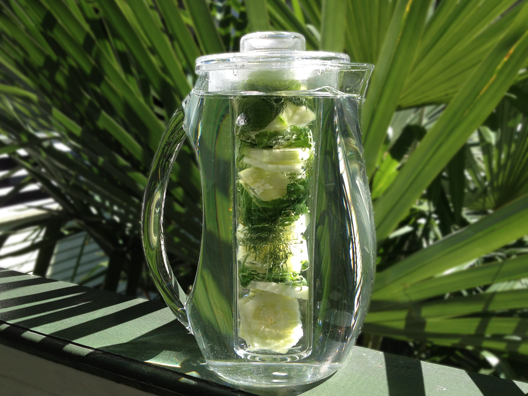 If you need a change from fruit flavored water, try this herb and cucumber mixture. It’s a light, fresh-tasting water that goes great with meals, especially sandwiches. Recipe for a 93-oz fruit infusion pitcher: 2/3 organic cucumber with peel cut off + 3 sprigs fresh dill + 6-8 fresh mint leaves, torn. Infuse 6 hours or overnight for best flavor. Cutting the cucumber rind off makes the ingredients look more sophisticated and removes the possibility of waxiness from the rind. Layer 3-4 slices of cucumber, then 1 sprig of dill, then a couple torn mint leaves, then repeat. Note: dill is very powerful in flavor, so be careful not to use too much. You may want to experiment with how much dill you enjoy.